We were having a decent discussion on the Larry Kudlow show tonight when Larry and Ron Kruszewski had to go all taxes and regulations on me. I’ve always thought that neither the logic nor evidence provided much support for that claim, especially compared to…oh, I don’t know…the worst demand slump since the Great Depression! When something changes, in this case, optimism or confidence among small businesses, you first look for something else that changed. Did taxes go up in the recession? To the contrary, the Recovery Act cut taxes by almost $300 billion and many more tax cuts followed (many, like equipment expensing and the HIRE Act—an employer-side payroll cut—targeted directly at small biz). Did regulation increase? This is a cue for the small biz lobby to fret about the Affordable Care Act, and I have heard actual business people raise legit concerns. But the Act exempts small businesses (with less than 50 employees) from the employer mandate. To be fair, in plowing through the data, I did find a smidgen of evidence to support Ron and Larry. 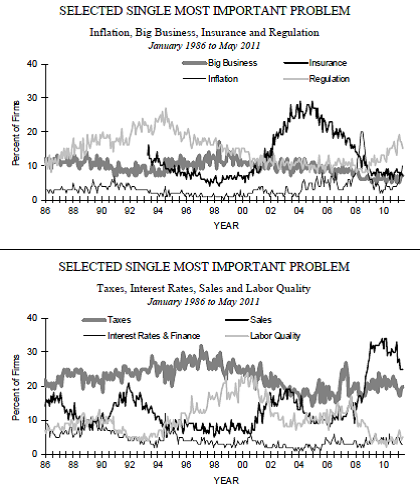 The second figure shows that the share of respondents citing poor sales (i.e., weak demand) as their biggest problem soared in the recession and the series remains at the highest levels in the charts. The tax series is by no means elevated, sitting right within its historical range. The first figure, however, shows regulation on an upward trend, so there’s something there. But it’s about back to where it was in the latter 1990s, while the “poor sales” indicator is still up in uncharted territory. So, if must cite regulation and taxes, don’t cite taxes, and please put regs in line well after weak demand. Share the post "What’s Your Problem?" 13 comments in reply to "What’s Your Problem?" Yes, Kevin, If the DATA supported it. The flaw in your argument is that there is no ‘there, there’. If my son came to me and could show me data and research that substantiated his argument I would raise his allowance and fire the teacher — because clearly he is a genius. I would then have to hire a qualified teacher — most likely for a higher salary, because you get what you pay for. but the DATA in this case is because the self-interested party said “I say so.” If you have the data — you don’t need to do the poll. The point is that you kid always says he needs a higher allowance and businesses always say that they need a tax cut. If you believe them, then you must believe everything that you ever heard since you were little. You might still believe in unicorns. You are confusing opinion and faith with facts. The tax code/ economic system is shaped by the behaviors we want as a society to foster and those we wish to discourage. By ‘we’, I also mean those with the money to influence. No one WANTS to pay taxes. Small Business is no different than any other group. What cannot be disputed is the evidence that lower taxes for a specific group do nothing to benefit the economy unless the incentives are in place that would foster the behavior that does so. If increasing a childs allowance were tied to academic performance than yes, you increase their allowance so they get good grades, go to the best college and get the best opportunity for a great career, then the get this great job, fancy car, and all the girls they want. Unicorns and tea parties are for little children with vivid imaginations. The influences — both positively and negatively on the economy are historically and mathematically measurable. “Supply Side” economics has proven to be an EPIC failure by every measure. The same people that put their faith in it each and every time, also said THEN deficits didn’t matter. Deficits never matter when your spending money like a ‘trust fund baby’, such that the heir never pays the price for poor decisions… the rest of us do. As far as consiumtion, I have found that consumer spending was up 5% from abour 65% to 70% during the last period of economic growth (before the housing crash), and this increase in consumer spending was fueled by more consumer borrowing not an increase in disposable income. So when the housing market crashed (housing being the big credit engine), consumer spending crashed. Its a given that we can’t recover until there are more jobs to create more disposible income for the middle class. But no one ever discusses how the significant redistribution of wealth upward toward the top 1% also helps create a downward in trend consumer spending significantly (i.e if one guy out of five has all the money, how can the other four guys spend anything). No one ever discussess this aspect of our problem, and I believe this is as serious an issues as it was during the Great Recession. Am I overstating this or are we like alcoholics in denial about the root cause of our problems? By the way, I am a small business owner (less than 50 employees), and demand for productsd IS the most important factor in my hiring of employees, not all this other stuff. If no one’s buying I’m not going to hire, period. As a small business owner, do you believe that the majority of small businesses in the United States are currently unable to capitalize on technological innovation? Do you believe existing small businesses have adapted to globalization? For me, as an engineer, this question is key, do you believe that university patents and laboratory/research institute patents have trickled down in some meaningful way that allows small businesses to capitalize on the knowledge, i.e. utilize the patent, alter the laboratory innovation and patent their own creation? The reason I ask these questions is because you raised the primary concern of demand. And I am wondering if there is enough information traveling into the small business pipeline in every section of the country, not just silicon valley, Harvard Business School networks, and other “elite” areas. Because the more choice the more entrepreneurship can occur and the more small businesses can capitalize and generate demand. Even Bill Kristol recently admitted that corporate taxes do not need to be cut. They are sitting on trillions of dollars because demand is so low. Once we get demand up, everything will be okay. It’s really that simple. So, how do we do that? Well, we cannot propose new spending because it will have no chance of getting through this Congress. Thus, President Obama should propose a massive tax cut for the middle class. Q: How do you get corporations to spend their money. A: Raise taxes. They won’t pay it, they will instead invest the money in a tax reducing way. Oh, and don’t forget to block the exits, as in treat dividends just like any other revenue. I know that answering a question with a question is quite annoying but here it is. The primary issue is the etc. What else is the government using my money for? What if as a business person I don’t agree to the way it is used? Why do I say that? Well my sense of optimism and faith states that there should be a recognition that no matter how talented an entrepreneur you are, society through the means of providing employees to your business, infrastructure, and atmosphere allows for business expansion. Admittedly, it is an entrepreneurs hard work that ultimately takes advantage of situations, capitalizes on new resources, and wisely invests in various segments. Ultimately, an entrepreneur may create a multi-billion dollar business from a small business. However, all those societal pieces were present to assist in that multi-billion dollar growth. As a result there should be a natural incentive to invest in the communities that have supported the company’s growth, depending on how far the business expands. Now, if non of the communities are desolate, are B+ to A communities in terms of quality of life, well then why should any money come out of the pockets of those entrepreneurs who took the risk and capitalized. What I would call the artificial economic mechanism imposed on society by a democratic government to create bonds and responsibility is taxes. And in a word higher taxes for wealthier members of society is a device to follow through on the above quotation. #1 the problem with any artificial system is that it does not deal with the root of the problem. #2 the root of the problem here is, does business have any “social” or rather any responsibility to society at all other than the creation of money? Mountain meet mole hill. All I was saying was to tax dividends at the standard income rate. What is unfair is to take an entrepreneur who doesn’t have a big enough company to set up the outlandish conditions the tax code in the Bush tax cuts set up for dividend income. Isn’t one definition of insanity doing the same thing and expecting different results? I see two examples. The first is obvious, expecting belief to function as sound economic policy because facts don’t bend to fit your beliefs and the more you willfully misconstrue the greater the gap grows between your beliefs and reality. The second may be less obvious: expecting believers to accept facts. I’ve seen this survey linked a couple of places, but no one has mentioned what o think is the most visible increase in regulation/enforcement over the last few years: illegal immigration. Between the significant increase in enforcement activities by the Obama administration and the passage of strict rules on businesses verifying citizenship in Arizona and Georgia (and potentially more to come), businesses that rely on illegal immigrant labor are potentially very worried about the implications. Dr. Jared Bernstein, what economic conditions do you believe are necessary to “reboot” or renew an economy, through a balance of top down and bottom up policies? While you prove through the statistics that demand is the greatest concern, how do you believe that the issue of taxes should be tackled? The current GOP argument concerning a requirement of lower taxes on all segments is an aspirational goal that I feel carries historical weight. What fundamental discussions do you believe underlie the struggle to create an effective economic solution? Do you think there are policies in place that were put in place during crisis situations and never reassessed or policies that never saw much public scrutiny?